The NEC DT710 6DE phone is an entry level IP phone in the DT700 series line-up and uses the same platform as the more basic NEC DT710 2E. The difference is the DT710 2E offers no display, no soft keys and only 2 customisable buttons. Although they are both DT710 models they are chalk and cheese in terms of usability and features. If you’re after a phone for kitchens, foyers etc then go for the cheaper 2E model. The NEC DT710 6DE phone is an entry level IP phone in the DT700 series line-up and uses the same platform as the more basic NEC DT710 2E IP phone. The difference is the DT710 2E offers no display, no soft keys and only 2 customisable buttons. Although they are both DT710 models they are chalk and cheese in terms of usability and features. If you re after a phone for kitchens, foyers etc then go for the cheaper 2E model. For an entry level phone the DT710 6DE IP with 6 keys doesn t miss out on much. There are 4 context sensitive soft keys below the LCD display as well as useful help and exit buttons. Context sensitive keys are buttons that present the most logical on screen options that change depending on what feature you re using at any given time. It s incredibly effective and very common today with most leading brands. It makes daily phone use for the DT 710 6DE VoIP phone much easier. The NEC DT710 ITL-6DE IP handset offers users 6 programmable buttons that are configured in a traditional pbx handset style below the screen. These buttons can be programmed to display not only phone lines and staff but also functions and speed dials. Next to the 6 keys are LED busy light indictors that present different colours. This allows users to quickly and visibly distinguish presence - whether staff are busy, free etc. If you need to see more than 6 staff at a glance you can choose to upgrade to the NEC DT730 12D IP handset which has 12 buttons and also features backlighting on the LCD screen for easier onscreen visibility in any light conditions. If you choose to wall mount the handset you can also buy an optional bracket which is great for kitchens, warehouses and the like. The DT710 6DE VoIP phone also comes with G.711, G.729A and G.722 (Wideband) CODEC s. This means you get superior call quality with the availability of wideband audio. Keep in mind that if you re looking to attach a wireless headset it s always a good idea to ensure that the headset is equipped with wideband audio too or you won t get the most from your NEC solution. There is no headset port for corded headsets so wireless is the only option for you. The NEC ITL-6DE phone also features a silver jog dial button at the bottom right of the handset. A lot of manufactures have adopted this on their handset designs because it makes accessing system directories, speed dials, redial lists and other system features much faster. One great thing about this and previous NEC handsets is the help button. NEC actually has a user guide built in to the handset and its fantastic if you ever forget how to do something. It s only a small thing but strangely for a great idea it s almost unique to NEC phones. 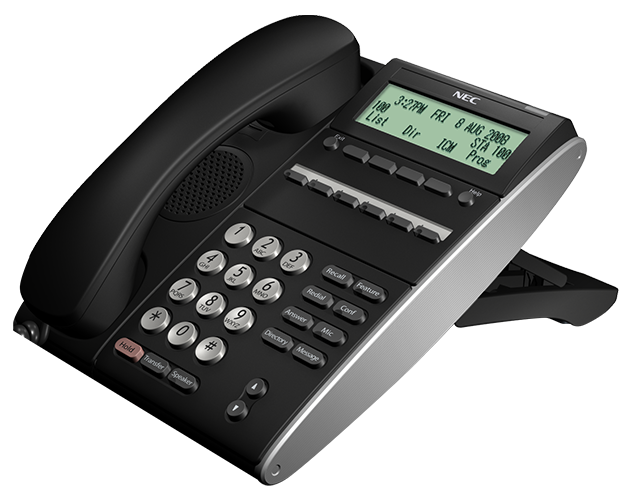 Like most IP phones, the NEC DT710 6DE VoIP phone is plug and play - in or out of the office. The only condition is that your Ethernet port is live and your IP address (if using remotely) is programmed to the pbx system. It makes ads moves and changes simple, especially when combined with the self administration function of the pbx. When moving to a new location your simply plug your IP phone in and login. The VoIP phone automatically registers and all your customised presets, extension number and programming are presented on screen. The NEC DT710 also comes with 2 Ethernet ports (both 10/100MB) so you can use the one port for both your office phone and your PC. If you operate a Giabit environment you can also get an optional Gigabit adaptor as well. For most users the NEC DT710 6E is a great option. With the NEC UNIVERGE SV8000 phone system series remember that you can easily mix and match to suit your needs and budget. So if you re looking for a cheaper digital phone option (not IP) then the DT310 6DE phone is identical in looks and functionality (without the on board 10/100MB LAN ports). For technical specifications of the NEC DT710 ITL-6E handset you can refer to the comparison chart following that illustrates all models and specs in the NEC DT700 IP series. Infiniti telecommunications is not affiliated with the manufacturer of this product in any way. Looking to learn more about NEC DT710 ITL-6DE IP Phone Handset?